I have received less Christmas Cards this than previous years and this seems to be a continuing trend. I think it is wonderful that many will donate now to their favourite charity rather than send Christmas cards. However there are some people I still send cards too, mainly old friends where I write a nice catch up letter at the same time. It seems to be the children that get the most cards, especially if they are still at primary school. Here I have listed six ways to use the cards after Christmas. 1. Reuse them. After Christmas I sort the cards out and some are reused by cutting out interesting shapes or images. These can then be made into new personalised, handmade cards. There is more thought in these handmade cards can if you stock up on plain cards and envelopes when you see them in the sale it works out cheaper than buying expensive cards. I am sure a recipient loves a home crafted card too. 2. Practice fine motor skills with younger children. This follows on from the first point but giving the children some safe scissors and letting them have fun cutting up card and making either new cards or just using the images in pictures is great for hand eye coordination. Erin spends hours cutting and crafting and this is a good way to provide her with free supplies that keep her entertained. With my money saving hat on I love this idea. Erin’s dad and I went to B&Q this week to look at wallpaper and I also ripped off a few samples. Once home Erin used one of these sample pieces to make a collage. 3. Donate them to the Woodland Trust or other similar charitable organisations who will have them recycled into notepads or cards for the future. I think we all need to take responsibility to ensure that we are putting less into landfill. 4. Use the fronts of cards as postcards and this is a great tip if you are a comper. When I enter postcard comps I like to try and match up the postcard with either the promoter or the prize. Whether it makes a difference who knows but I am quite lucky at winning competitions! 5. There are plenty of ideas on pinterest if you are crafty. I am not that creative but I do use the old cards to make bookmarks or even to decorate other items like a gift box or bag if I putting a gift in a box rather than wrapping. 6. Finally personalise a wrapped present. Use cheaper brown parcel wrapping and use some of the cut outs to add a personal touch. Again you can make gift tags. I especially like doing this for grandparents and family members when the present is from the children as they get to be involved in the whole process from wrapping and decorating. My Mum always used last years cards as gift tags when I was young! 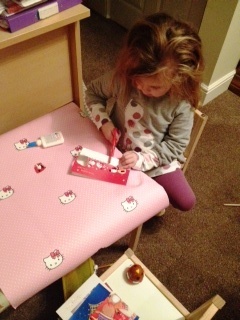 I let Syd use them for craft – he loves a bit of snipping and gluing! Ooooh, great ideas. I’m glad I haven’t thrown mine away now. i received less too but I also sent less. I couldn’t wait to take them all down to be honest, especially the 60 odd that the girls brought home from primary school. Thank goodness next year they’re at junior school! 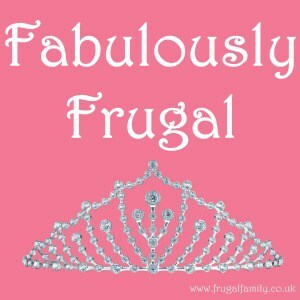 Cass@frugalfamily recently posted…Are you a crafting queen? No, me neither….